It's that time of year that we begin our reports summarizing the season for the Blue Jays' minor league affiliates. We continue our reports with the class-A Advanced Dunedin Blue Jays. The Dunedin Blue Jays, under first-year manager Casey Candaele, staved off a sub-.500 record by finishing 69-68, four games below a Pythagorean record of 73-64. The D-Jays definitely showed improvement in the second half: after finishing 31-37 in the first half, in second-last place in the North Division of the Florida State League and seven games back of the leader, they moved up to third place with a 38-31 record but were still seven games back of the division leader. The Dunedin Blue Jays had a solid offence, scoring 4.50 runs per game, good for second in the league, and about a third of a run better than the league average (4.21 r/g) with an offence that averaged 0.3 years older than the league average of 22.4 years. The pitching was more towards the back of the pack, allowing 4.19 runs per game which was still slightly better than the league average of 4.21 runs per game with a pitching staff that was 23.2 years old on average, 0.2 years older than the league average age. Congrats to Joshua Palacios, the runaway Player of the Game Champion! The Player of the Year question comes down to a few players with several meriting consideration. Kevin Smith played in 83 games and led the club with 18 home runs (10 more than his nearest competitor) while Ivan Castillo led the league with a .304 batting average, tied with teammate Rodrigo Orozco. Joshua Palacios finished second in the league in doubles. Or Brock Lundquist who was excellent after arriving from Lansing? But the winner is going to be Kevin Smith, who had the best OPS on the team for players with more than 300 at bats and, had he qualified, would have had the second-best OPS in the league. It makes it really easy to pick a winner for the best pitcher on the team when the pitcher wins the Florida State League award too. So congrats to Patrick Murphy! There were several strong contenders here too, with Yennsy Diaz pitching well after coming up from Lansing, Tayler Saucedo pitching well before his promotion to New Hampshire and Zach Logue also doing well after arriving from Lansing. In fact, Murphy gets the nod over Logue due to a heavier workload with Dunedin. There was a strong group of relievers with Dunedin at one point or other during the year. Travis Bergen had a strong year before moving up to New Hampshire and Jonathan Cheshire had a very good year, if it was a bit unheralded. Jackson McClelland was also quite solid, particularly as the year went on. But the one pitcher who was consistently strong and ended up throwing 57 innings (the most for any reliever), leading the team with 44 appearances, was lefty Jake Fishman whose 1.00 WHIP and 2.68 ERA were stellar as was his 56 strikeout to 11 walk ratio. We're going to start our more in-depth look at the Dunedin Blue Jays by looking at starting pitchers. We're going to include anyone who made 50% of his appearances as a starter, or logged enough innings to gain consideration. If a player played for more than one team over the course of the season, he'll be grouped according to the club he played the most with. Leading the Dunedin Blue Jays in starts and innings was 2018 Florida State League Pitcher of the Year Patrick Murphy. The 23-year-old righty has posted three strong seasons now since returning from injuries that plagued the beginning of his professional career and he tossed 146 2/3 innings with the Dunedin Blue Jays, providing a 2.64 ERA and 1.20 WHIP, striking out 22.5% of batters while walking just 8.3% and getting a very strong 59.4% of balls hit on the ground. Murphy also got a spot start in New Hampshire, tossing six innings and giving up two runs on four hits and three walks with six strikeouts. Murphy is eligible to be drafted in the Rule 5 draft and the Blue Jays will have to make a tough decision as his ability to throw in the high 90s (touching 98 mph) with four pitches could make him attractive to other teams if he's not protected on the 40-man roster. Zach Logue, 22, started his season in Lansing and excelled there, posting a 2.67 ERA and 1.13 WHIP over 54 innings with a 20.7% strikeout rate and 5.2% walk rate. He was promoted to Dunedin in late May, where he made another 18 appearances (16 starts), throwing 100 1/3 innings with a very solid 3.41 ERA and 1.25 WHIP, striking out 20.2% and walking 5.5%. While he had a couple of blow-ups along the way (giving up nine runs in two-plus innings on August 8, he also had four games in which he didn't give up a run (including two back to back in mid-July) and only gave up one hit and one walk in six innings on August 3, striking out eight and he struck out 10 in a six-inning start on August 13, bookending that blow up on August 8 with two excellent outings. Look for Logue to start in Dunedin (the Blue Jays have way too much pitching talent in the higher levels) but he could be in New Hampshire at the All-Star Break. Yennsy Diaz was one of the most dominant pitchers in the Midwest League when the 21-year-old started the season. He struck out 10 in his debut, tossing 5 2/3 one-hit innings and allowed just one earned run all month, earning himself the MWL Pitcher of the Month award. He had one bad outing (May 5, eight runs in three-plus innings) but had three more strong starts in May before he was promoted to Dunedin towards the end of the month. Overall, in nine appearances with Lansing, he had a 2.08 ERA and 0.99 WHIP, striking out 22.0% of batters but walking 13.1%. Promoted to Dunedin, he continued his strong work, throwing 99 2/3 innings with a 3.37 ERA and 1.19 WHIP, striking out 20.3% of batters but he reduced his walk rate to just 6.9%. Diaz is another candidate to move up to New Hampshire but may start up 2019 back in Dunedin in the warm weather before moving north. Tayler Saucedo, the 6-foot-5 Hawaiian lefty, enjoyed a tremendous amount of success for the Dunedin Blue Jays, making 15 starts and posting some of his best numbers of his career. In 85 innings, Saucedo had a 3.49 ERA and 1.13 ERA, striking out 18.9% of batters and walking only 5.2%, cutting his 2017 rate with Dunedin by more than half. He also got 56.4% of balls hit on the ground and he moved up to New Hampshire in early July where he finished his season there. While inconsistency has been Saucedo's modus operandi as a professional, he turned things around in 2018 and while he had a 5.17 ERA and 1.52 WHIP with the Fisher Cats, striking out 13.6% of batters and walking 6.5%, he had only three starts in which he gave up more than four runs (out of 11 starts and 62 2/3 innings), providing a solid arm to eat up some innings for the Fisher Cats. Saucedo can certainly return to New Hampshire and will look to follow up a strong 2018 with some more success at the double-A level in 2019. The Blue Jays' top pitching prospect, Nate Pearson, had a tough season. He started the year on the DL with an oblique injury (after I saw him just dominate in spring training), and then, in his first outing of the year on May 5, he had his elbow broken by a line drive that ended his season before it really got under way. He allowed three runs (two earned) in 1 2/3 innings on five hits and struck out one before he hit the DL but got into action in the Fall Instructional League and is currently with the Surprise Saguaros in the Arizona Fall League and he's allowed seven earned runs on eight hits and seven walks with seven strikeouts in 4 1/3 innings (although, according to Tim McClelland, Jackson's dad who's in Arizona watching the games, Pearson was thoroughly squeezed by the home plate umpire in his second game). We move on to the relief pitchers for the Dunedin Blue Jays, looking at pitchers who made most of their appearances out of the bullpen. The Dunedin Blue Jays' leader in relief appearances was lefty Jake Fishman. While not overpowering, the lefty has excellent sink on his pitches and he induced 46.9% of his batted balls on the ground. Fishman tossed 57 innings for the Blue Jays over 44 appearances and had a 2.68 ERA and 1.00 WHIP, striking out 24.8% of his opponents while walking only 4.9%. Fishman made a mid-season appearance with the Buffalo Bisons on June 26, throwing 1 1/3 innings, retiring all four batters he faced with one strikeout. Fishman can probably pitch in New Hampshire next year and will likely get a chance at some point but his starting level can't be guaranteed. William Ouellette made 35 appearances with Dunedin logging 45 2/3 innings, posting a 4.14 ERA and 1.66 WHIP, striking out 12.8% of batters and walking 6.2%. The 25-year-old non-drafted free agent had a solid season for the D-Jays and was well-used by manager Casey Candaele. I'm not sure if he'll move up with a lot of competition for bullpen spots in New Hampshire next year. Connor Eller, 24, had a 4.14 ERA in a swingman role with the Dunedin Blue Jays, making 12 starts and throwing 79 2/3 innings. Eller had a 1.57 WHIP with a 15.0% strikeout rate and 8.0% walk rate. Eller made a May appearance with the Buffalo Bisons, giving up five runs on five hits in 1 1/3 innings, walking a batter. Starting towards the end of July, Eller moved into the Dunedin rotation and actually had better numbers with a 4.34 ERA and 1.45 WHIP in that role as opposed to a 5.13 ERA and 1.86 WHIP as a reliever, although his OPS against was .758 as a starter and .788 as a reliever. Look for him back in Dunedin next year. Hard-throwing righty Ty Tice made the most of his second year as a professional, spending most of his season with the Dunedin Blue Jays. The 22-year-old was the 16th-round pick of the Blue Jays in 2017 and he utterly dominated in 10 outings in Lansing, tossing nine innings with a 0.00 ERA, allowing only one unearned run on five hits and three walks with 12 strikeouts before moving up to Dunedin. There he posted a 2.70 ERA and 1.20 WHIP, striking out 21.6% of batters while walking 10.3% in 50 innings. For someone who isn't the tallest pitcher (Tice is listed at 5-foot-9), he surprisingly had a very good ground ball rate in Dunedin, getting 48.9% of balls in play in the ground. He could move to New Hampshire but I wouldn't be surprised if he started back in Dunedin for the first part of 2019. Jonathan Cheshire, 23, also made it to Dunedin in his second professional season after being a 36th-round draft pick in 2017. Cheshire made 33 appearances and threw 51 innings, posting an excellent 2.47 ERA and 1.06 WHIP, putting him in the running for Reliever of the Year. Cheshire struck out 21.3% of batters and walked only 5.7% and got 54.2% of his balls in play on the ground, giving him a very solid profile moving forward. Like many relievers who spent most of the year with Dunedin, his season-opening promotion is not guaranteed but his solid season in 2018 helps his case. Jackson McClelland, 24, blossomed in 2017 and found some increased velocity. In 2018, he flashed that velocity but also dealt with some injuries and wasn't as consistently dominant as he was in 2017. McClelland, who hit triple digits on the radar gun in 2018, pitched to a 4.10 ERA and a 1.15 WHIP in 37 1/3 innings with Dunedin but he missed some time from the end of April to mid-May. While he was lights out in April, he struggled in May and gave up a lot of hard contact (with two doubles and three home runs against) before slamming the door shut in July, limiting hitters to a .432 OPS in that month (including a .161 SLG) and he was rewarded with an August promotion to New Hampshire. McClelland maintained his 30.2% strikeout rate after his promotion, striking out 28.1% of batters but the walk rate, which he had under control in Dunedin (10.1%) started to balloon in New Hampshire (15.6%) although the sample size of 6 1/3 innings was pretty small and he allowed five runs (four earned) on seven hits and five walks with nine strikeouts. McClelland is eligible for the Rule 5 draft in December and the Jays have a tough decision. Power arms like his don't just grow on trees and he's been sent to the Arizona Fall League for the second time to see if he will merit adding to the 40-man roster. 24-year-old Venezuelan lefty Juliandry Higuera had a tough season with the Dunedin Blue Jays, making 28 appearances and throwing 43 innings with a 6.07 ERA and 1.67 WHIP. Higuera struck out 17.9% of batters but walked 12.2% and had a solid, 46.0%, groundball rate. Higuera finished the season with the Buffalo Bisons, giving up two runs on one hit and two walks with one strikeout in 2 1/3 innings. Higuera will be in the final year of his initial contract and could start in New Hampshire if the Blue Jays really want to see what they have in him. After seven years in the Blue Jays' organization, Angel Perdomo had shown a lot of potential but struggles staying healthy and remaining consistent have made it difficult to advance beyond A-ball. Perdomo, 24, didn't get his season started until late April and pitched out of the rotation mostly until July when he missed about three weeks due to injury. When he returned from injury, he was a reliever. Overall, in 26 appearances, including 12 starts, Perdomo had a 3.63 ERA and 1.30 WHIP in 79 1/3 innings. He did show a tremendous ability to miss bats, striking out 29.4% of batters while walking 10.3% (down from 2017, also in Dunedin). The lefty didn't have particularly big splits between lefties and righties, allowing a .659 OPS to left-handed batters and a .692 OPS to righties while also showing similar splits as a starter and a reliever, posting a .676 OPS against as a starter and a .693 OPS against as a reliever. Notable was the fact that Perdomo walked far more batters (17 in 21 2/3 innings) coming out of the bullpen despite seeing a much higher strikeout rate. If he re-ups, look for Perdomo to move to New Hampshire, possibly in a relief role. 24-year-old Nick Hartman split his season between Dunedin and New Hampshire, making 21 appearances and throwing 30 innings with Dunedin and throwing 18 times with 28 1/3 innings as a Fisher Cat. Hartman had a 4.96 ERA with the Blue Jays in 16 1/3 innings before moving up to New Hampshire in mid-May and he was back in Dunedin at the beginning of August to finish his season in Florida. Overall, Hartman had a 4.80 ERA and 1.70 WHIP in 30 innings with Dunedin, posting a stellar 27.5% strikeout rate and solid 7.3% walk rate. In 28 1/3 innings with New Hampshire, he had a 5.40 ERA and 1.84 WHIP, striking out only 15.4% and his walk rate ballooned to 11.8%. Look for Hartman back in New Hampshire next year. Righty Andy Ravel spent his 2018 season in the bullpen after being a starter for his first two professional seasons. Now 24, Ravel was excellent to start the season with Lansing and made an appearance in Dunedin on May 5, giving up three runs (two earned) in two innings before heading back to lansing where he gave up runs in three of his next five outings. Despite the inconsistency, he was back in Dunedin at the beginning of June and stayed there for the rest of the season. Ravel tossed 21 1/3 innings in Lansing, posting a 3.80 ERA with a 1.50 WHIP, striking out 17.4% (his career high) and walking 7.6% of batters. In his time in Dunedin, he had a 6.85 ERA and 1.61 WHIP, striking out 16.5% of batters and walking 8.3%. I can see Ravel back in Dunedin next year. The Blue Jays picked up 23-year-old righty Bryan Baker in a trade from the Colorado Rockies for cash in August. Pitching in the hitter-friendly California League (Advanced-A), Baker had a 3.80 ERA but a 1.80 WHIP, walking 15.7% of batters and striking out 26.9%. In the Florida State league, he threw 6 1/3 innings, showing his quality by striking out nine and walking just three batters, giving up two runs. At 6-foot-6, Baker is a big-bodied righty who might be a reliever who can move in the next couple of years. We turn to the hitters of the Dunedin Blue Jays to see who did what in 2018. We'll start with the catchers and go around the horn to the infield and then to the outfield. We'll start with Riley Adams who got the most reps behind the plate, catching 93 games and throwing out an incredible 46% of potential base stealers. Adams jumped over Lansing after playing in Vancouver last year and the 22-year-old hit .246/.352/.361 with 26 doubles, a triple and four home runs in 409 plate appearances. Adams saw a drop in his ISO while also seeing his BABIP fall almost 70 points (corresponding almost exactly with his batting average's 59-point drop) but saw his walk rate rise to 12.2% while he only struck out 0.7% more at 22.7%. Look for Adams to reach double-A at some point next season but he might have to wait until after the season starts. Italian Alberto Mineo was acquired by the Blue Jays in the minor league phase of the Rule 5 draft last year and, after coming off a breakout year (offensively) with the Cubs' A-ball team in South Bend in 2017, he posted another strong offensive season in his Age-23 year with Dunedin. In 34 games, he hit .294/.377/.406 with 14 doubles, a triple and two home runs while throwing out a very solid 37% of potential base stealers. Mineo struck out only 17.5% of the time while walking in 10.9% of plate appearances and he hit .462/.533/.692 with a home run in 15 at bats with Buffalo. Look for Mineo to be a backup in the high minors at the age of 24 in 2019. Kacy Clemens played first base every day after his promotion from Lansing but the offensive environment in Dunedin and the Florida State wasn't kind to the 24-year-old slugger. In his second year as a pro, the 2017 eight-round pick started off by destroying the Midwest League, hitting .301/.454/.624 with five doubles, two triples and seven home runs in 27 games, surrounding a one-game call up to Dunedin on April 15. Promoted to Dunedin for good on May 7, but things went south quickly. He hit .222 (with a solid, .351 OBP) for the rest of May but hit .169/.262/.225 in June, rebounded to hit .266/.297/.404 in July but returned to the sub-.200 club in August, hitting .192/.281/.269. In total, Clemens hit just .211/.292/.307 with 15 doubles, a triple and five home runs in 383 plate appearances (more than three times as many as he had in Lansing). Clemens walked at a 21.0% rate in Lansing but that rate dropped to 9.9% in Dunedin while his strikeout rate jumped from 18.5% in Lansing to 24.5% in Dunedin. Interestingly, his BABIP wasn't unsustainably high in Lansing (at .328) and it dropped to .272 in Dunedin which doesn't account for the 90-point drop in batting average. Look for Kacy back in Dunedin to start and hopefully he'll regain that stroke that saw him dominating in Lansing. Ivan Castillo was a versatile player for the Dunedin Blue Jays, playing 39 games at second base, 31 at third, 11 at shortstop and 19 in the outfield. The 23-year-old Dominican, also acquired in the Rule 5 draft in 2017 not only led the team in games played at second base but he also tied for the league lead in batting average, hitting .304/.345/.448 with 25 doubles, eight triples and five home runs while stealing eight bases in 16 attempts. Castillo has never struck out much and he continued that trend with a 12.2% strikeout rate while walking in only 5.5% of his 418 plate appearances. Look for him either in Dunedin or New Hampshire next year. 26-year-old infielder Nash Knight was more than just a utility man for the Dunedin Blue Jays: he got to play all nine positions on the final day of the year. Knight played 99 games for the Blue Jays, hitting .246/.335/.317 with 14 doubles, a triple and three home runs and he got into 11 games with New Hampshire, hitting .161/.212/.258 with a home run. Knight had a 9.8% walk rate while striking out in 16.8% of his plate appearances. Knight also became a go-to pitcher, getting into four games and giving up one run on four hits in 2 1/3 innings and he tossed an inning in New Hampshire, allowing a run on three hits. Knight should be back with Dunedin next year. Shortstop Kevin Smith capped off a tremendous season in his second year as a pro, starting by dominating Lansing and finishing with a strong year in Dunedin. First, Smith hit .355/.407/.639 with 23 doubles, four triples and seven home runs in just 204 plate appearances in Lansing, stealing 12 bases while walking in 8.3% of his plate appearances and striking out in 16.2%. His BABIP of .397 was probably quite unsustainable and he saw a 78-point drop when he went to Dunedin which corresponded to an 81-point drop in batting average. While his batting average fell, he still hit .274/.332/.468 with eight doubles, two triples and 18 home runs to give him 25 dingers on the season and he also stole another 17 bases to give him 29 on the year. Smith did see a decline in his walk rate to 6.2% in Dunedin while his strikeout rate rose to 23.7%. With several other infielders in the way, he might not start 2019 in New Hampshire but you can bet that he'l be there by year's end. The Blue Jays' first-round pick of 2017, Logan Warmoth, 23, skipped over Lansing to start his season in Dunedin but he never really found his groove, with a slow April and may, followed my missing most of June and part of July and not quite getting things back in August. Warmoth hit .248/.322/.319 in 75 games, hitting 13 doubles, two triples and a home run, striking out in 21.4% of plate appearances and walking in 9.3%. He did play four games on the rehab trail in the GCL, going 3/11 with two walks and four strikeouts, getting hit by pitches three times. Warmoth might stay in Dunedin trying to find the swing that had him hitting much better in 2017 with Vancouver to start 2019. Chad Spanberger, acquired by the Blue Jays in the deal to send Seung-hwan Oh to the Colorado Rockies, played 22 games with the Dunedin Blue Jays after hitting .315/.363/.579 with 22 home runs in 92 games with Colorado's Class-A affiliate. He then hit .278/.289/.500 with the Lansing Lugnuts in nine games, hitting a triple and two home runs before he came to Dunedin for the remainder of the year, hitting .231/.348/.372 with two doubles and three home runs in 92 plate appearances. The 22-year-old first baseman struck out 18.5% of the time in Dunedin and walked 15.2% and brings outstanding raw power to the organization. He'll probably start back in Dunedin in 2019. David Jacob was one of a number of Dunedin Blue Jays who retired in the course of the 2018 season. Jacob 23, struggled to make contact when he was in the lineup, striking out in 27.0% of his plate appearances but he did walk in 9.8% and hit .205/.310/.344 with six doubles and five home runs in 174 plate appearances. Jacob started injured, not seeing action until the beginning of June and he played until August 6 when he retired. John La Prise has been snake bitten with injuries since he was drafted in the 19th round of the 2015 draft, so much so that he, too, retired during the season. La Prise, who didn't even play in 2017, hit .230/.327/.296 with four doubles, a triple and a home run in 156 plate appearances, striking out 33.3% of the time and walking 12.2%. La Prise retired in early July. Infielder Yeltsin Gudino split his time between Lansing and Dunedin, starting in Dunedin and hitting quite poorly in 16 games before getting sent back to Lansing. He got into 38 games with the Lugnuts, hitting .321/.392/.373 with seven doubles before moving back up and hitting .238/.310/.250 in 188 plate appearances with Dunedin, hitting just two doubles over the course of the whole season. Gudino, still just 21, struck out in just 3.8% of his plate appearances in Lansing but that number bumped up to a still-low 13.8% in Dunedin while he kept a steady walk rate, going from 9.6% in Lansing to 9.0% in Dunedin. I think Gudino will be back in Dunedin in 2019. J.C. Cardenas started the year on the DL and played in one game, going 1/4 with two strikeouts when he was released in June. Eduardo Pinto played 38 games in left field and 63 games overall with the Dunedin Blue Jays, hitting .308/.356/.410 with 15 doubles, a triple and two home runs, striking out in just 6.0% of his 251 plate appearances and walking in 6.0%. He got into 35 games in New Hampshire, seeing a big drop-off in performance, hitting .218/.242/.290 with three doubles and two home runs, walking in 3.1% of his 130 plate appearances and striking out in 13.1%. Joshua Palacios had a strong season for the Dunedin Blue Jays, riding his hot streaks and pushing through the cold ones to compile a .292/.357/.418 slash line with 30 doubles, five triples and eight home runs with 15 stolen bases in 24 attempts in 562 plate appearances, walking in 8.4% of his plate appearances and striking out in 22.2%. He got into one game with the Fisher Cats before the end of the season, going 0/3 but played in six games in the postseason, helping the Fisher Cats to a championship, hitting .250/.304/.350 with a triple, a walk and six RBI. I can see Palacios starting 2019 in New Hampshire. Rodrigo Orozco played 112 games in his Age-23 season with the Dunedin Blue Jays, hitting a solid .304/.375/.389, tying teammate Ivan Castillo for the batting championship while hitting 23 doubles, three triples and a home run and stealing 18 bases in 22 attempts. Orozco didn't strike out much, sitting down in 12.5% of his plate appearances while walking in 9.4%. He could also move up to New Hampshire next year. 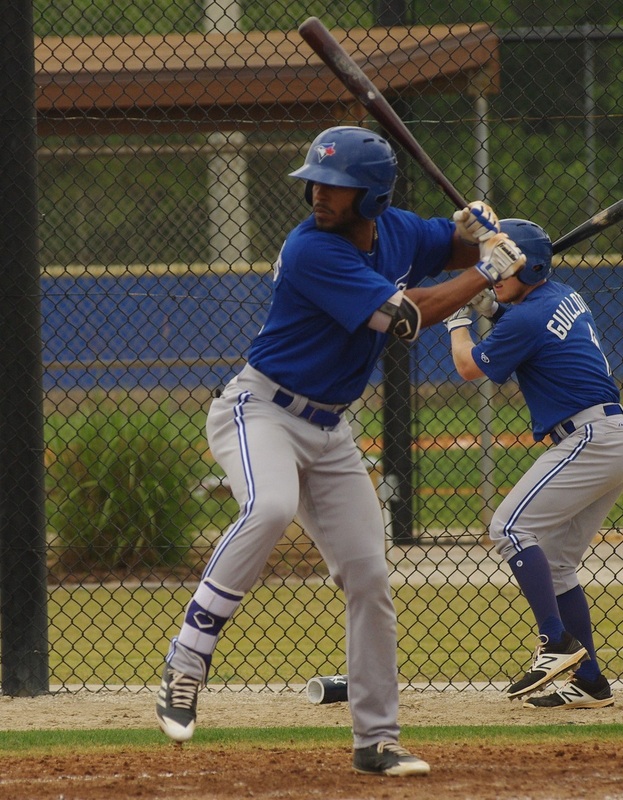 In his third go-round with the Dunedin Blue Jays, 23-year-old D.J. Davis hit .239/.308/.358 in 36 games, hitting five doubles, a triple and two home runs before the former first-round pick was released on June 15.